Carnavál Starts Thursday Night! | ¡VidaMaz! Are you ready? Remember that the fun starts this Thursday night (Feb 7th) with the coronation of the King of Alegría, starting at 7:30 pm in Olas Altas in front of the statue of the Mujer Mazatleca. Main parade is Sunday, and closing parade will be Tuesday the 12th. Here is a teaser from parade preparations last year, to build your party momentum! There are loads of talented people in this gorgeous world of ours. We all have a unique contribution to make, and if we collaborate, I am confident we have all the pieces we need to solve any problem we face. I have been an intercultural organizational effectiveness consultant since 1979, working primarily with for-profit multinational corporations. I lived and worked in Japan in the late 70s through the 80s, and currently live in and work from México, where with a wonderful partner we've raised a bicultural, global-minded son. I have worked with organizations and people from over 100 nations in my career. What's your story? Glad you enjoyed it, Cathy! Please, pass it around. Our Carnavál rocks! 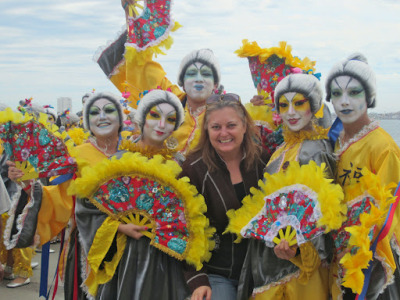 7 Tips So You Don’t Miss the Best of Carnaval de Mazatlán! You are most welcome to repost and share these blog posts, as long as you MAINTAIN LINKS AND COPYRIGHT TO OUR BLOG and the original post (e.g., ©Dianne Hofner Saphiere, VidaMaz.com). We are happy when you can make use of them for tourism promotion, expatriate blog curation sites, travel articles, condo newsletters, hotel advertising, etc. Our goal is to share the real experiences of a US American family living in Mexico. ¡Mil gracias y muy buen día!